For collecting in the field little more is needed than a really good magnifying lens and a fair number of small plasic bags. It is a good idea to include a flower or another characteristic plant part along with the mine, to remember at home the plant species the mine was taken from. The most convenient bags are self-closing by a sort of tongue-and-groove system at the top, of 10 x 15 cm (they are officially called minigrip bags in Dutch shops). It is important that the bags are completely closed, and that no more than one species (of plant and miner) is put in one bag: some larvae leave the mine surprisingly quickly, sometimes already pupating in the bag. Because of their stiff closing system ‘minigrip bags’ remain flat. This is an advantage because the leaves are not folded, but especially because the little air in the bag prevents desiccatiion. Well closed bags can be kept safely for several days, preferably, but not necesssarily, in a refrigerator. 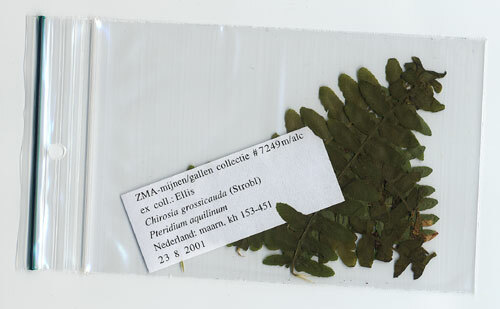 After identification the plant material may be dried as herbarium specimens in a plant press – easily made from two boards of about the size of half a newspaper, and two tightening bands, avaialble in a sport shop. Keep the leaves pressed for at least a fortnight, and between ample newspapers, to prevent moulding. The bands should be tightened at all force, otherwise the leaves may not dry perfectly flattened – drying in an old telephone book definitely is not a good method. Dried leaves can be kept in envelopes. I myself keep them in the same plastic bags that are used for collecting; the bags are arranged as cards in an oldfashioned card file. Mines are much more variable than insects, and therefore identification is not possible in all cases. Sometimes this variability is understandible. Leaves exposed to the full sun are thicker than leaves of the same plant in permament shadow. To obtain the amount of leaf tissue necessary for complete development, a larva therefore needs to make a mine with a larger in surface when it happens to live in shadow leaf. Blotch mines are larger in this situation, and corridors are longer and more loosely wound (Bruun, 1989a). Much more trivial is the fact that mines grow older; rain water that penetrate the mines may also change the structure of the frass or carry it away. Another problem is that of many species the mines, but much more still the larvae, are uncompletely known – not infrequently not known at all. This was the main problem in the construction of the keys. For example, the larva of the common Stigmella samiatella is not known. This fact, and the large variability in mine sturcture, make it impossible to identify with certainty the omnipresent and conspicuous Stigmella-mines that occur on Oak (St. basiguttella excepted). Larvae and pupae can be pried out of a mine using a really fine pincet and dissection needles. They are put in a watch glass in a few drops of water with a trace of detergent, to prevent them to float on the water surface. Larvae are killed by briefly and quickly heating the glass (a teaspoon will do too) over a cigarette lighter. Heat them untill all movements have stopped – heating too long will turning the larvae opaque, making observation of internal structures like the cephalic skeleton difficult. Larvae and pupae can be stored in 70 alcohol (ethanol); I myself use a mixture that has been developed by E von Törne for Collembola: 1 litre of isopropanol + 30 ml concentrated acetic acid + 3 ml formaldehyde 40%. When fresh larvae are put in either liquid they are quickly dehydrated, and often collapse into something unsightly. To prevent this I fixate them during some weeks in KAAD: isopropanol 100 ml + glacial acetic acid 20 ml + kerosene 10 ml + dioxane 10 ml. 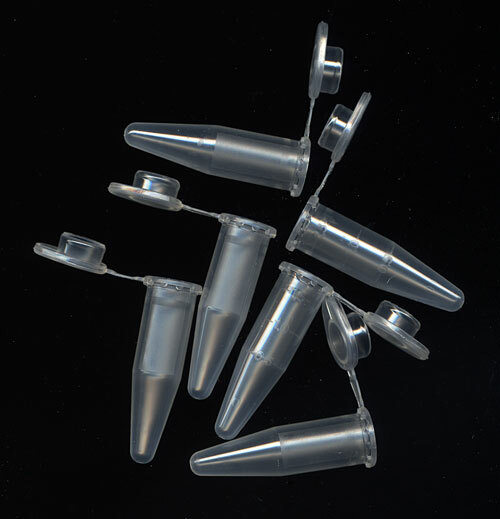 Larvae and pupae are stored with a number-label in plastic tubes of 1.5 ml that are commonly used as disposable ‘Eppendorf microvials’ in biochemical laboratories. The number corresponds with the number in the mine herbarium and with a databse (Filemaker) in which records are kept of all field data and identifications. 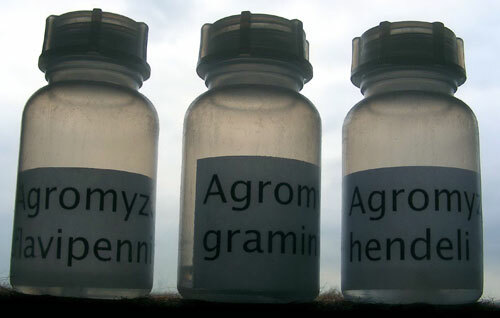 The microvials are stored per species in plastic pots of 50 ml; their labelling is also printed from the database. In order to study larvae that have been preserved it mostly is necessary to clear them. This can be achieved with chloralphenol, which is a saturated solution of chloralhydrate in liquefied phenol. When a small larva is put in a few drops of this liquid is becomes glassy in a few minutes. Freshly killed larvae tend to burst when they are immerseed in chloralphenol, they should be fixated for some days beforehand. Chloralphenol is toxic, and has a strongly unpleasant smell; it is not freely obtainable; in the Netherlands at least one needs the support of an institute to obtain it. For clearing purpose also clove oil has been used, but I have no experience with it. Permanent slides can be made by treating the larvae with a diluted solution of KOH, rinsing with destilled water, transferring in alcohol, light colouring with Chlorazol Black, and after stepwise hightened alcohol concentration, embedding in Euparal. Hering (1954a) extensively describes the making of slides of Agromyzidae larvae. Most pictures of mines are made with a flatbed scanner that has the additional possibility to make scans of large diapositives and photo negatives (Epson Perfection 2450 Photo). All micro photos are made with a Leica stereo microscope (MZ 16) with a built-in digital camera (DF 320). Deschka (1998a) presents an extensive discussion of all aspects of the study of mining Lepidoptera.